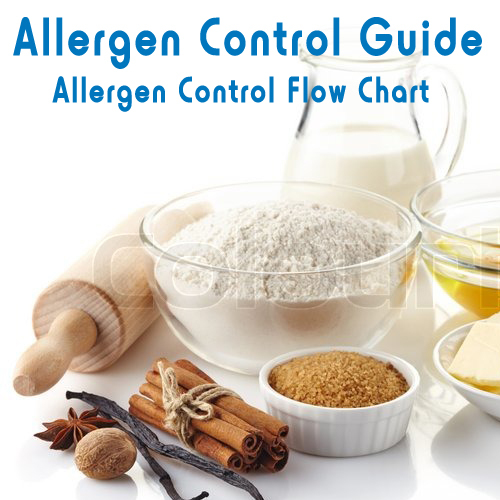 Click to download Emport’s Allergen Control Flow Chart. The Food and Drug Administration has specified that all products with a gluten free label must not only contain no gluten ingredients, but must also meet the less than 20ppm guideline for accidental, unavoidable gluten contamination. Although these regualtions do not include specifics on how the food safety plan must be created, there is a compliance guide available on their website that addresses the goals of the FDA ruling. Aside from gluten, the FDA provides information to manufacturers about compliance with allergen control to maintain compliance with the Food Allergen Labeling and Consumer Protection Act of 2004 (Title II of Public Law 108-282). Their recommendations include a guide for inspections. The FDA does not have a specified acceptable PPM or PPB limit on allergen contamination. There are many certification agencies and food safety consultants happy to review your facility’s current practices and work with you to develop or refine your HACCP plan to include allergen/gluten best practices. While creating a safe, contamination-free environment for food production is different for every facility, the infographic on this page is a general guide for recommended testing procedures using the GlutenTox range of professional test kits. Whether your facility is dedicated to producing gluten and allergen free products, or includes lines shared with allergen containing recipes, identifying hazard points is your first step in managing the risk of cross contamination. Where is contamination most likely to occur? Which of your ingredients are highest-risk, and which steps in your manufacturing process are most likely to involve inadvertent exposure to gluten or allergens? A well thought out quality control plan takes experience and expertise to develop and to implement, but will result in benefits to your final product and ultimately the consumer. There aren’t any easy one-size-fits-all solutions to effectively control hazard points in the manufacturing process. Minimizing hazard points and identifying best practices takes experience and expertise. Click to download Emport’s Best Practices Guide for sampling. Your employees are your greatest allies in maintaining compliance with the FDA ruling. They are on the front line and will be directly responsible for successfully implementing your quality control plan. All of your employees should be properly trained in what indicators to be alert for, when to test for both hazard assessment and procedural validation, how and where to sample, and how to report their test results. Establishing guidelines for the prevention of gluten or allergen cross contamination could include banning gluten containing foods from the facility, repeated training on thoroughly cleaning equipment, and even education about what exactly gluten is and why it needs to be monitored. One thing is clear: gluten and allergen testing should be conducted on an ongoing basis, providing validation on the outcomes of your quality control plan. GlutenTox and AlerTox test kits are easy to use, and require no lab equipment or scientific training. Since they are highly portable, tests can be conducted by your employees at any point in the manufacturing process or any position within the facility. If you are running a shared facility, scheduling will be an integral part of the design of your hazard plan. Deliveries of sensitive ingredients might be scheduled to arrive on different days from traditional ingredients so that there is lower risk of cross contamination. Arranging for traditional production lines to cross minimally with allergen free lines can aid in lowering risk factors, as can minimizing the frequency of transitions between running allergen-free and allergen-full products. Whether your facility is dedicated or shared, validating your suppliers is an important step in establishing safety from contaminants. A supplier should be able to provide their safety qualifications, including the frequency with which they run tests for allergen contamination. A reliable vendor will not merely assure you that ingredients are safely gluten-free or allergen-free: they will prove it. Even so, especially when bringing a new supplier on board, it is important to test incoming ingredients for consistent safety. GlutenTox and AlerTox test kits can be used to identify contaminants in dry and liquid ingredients, both raw and cooked or processed. Keeping your manufacturing environment clear of hazards is a challenge, especially in shared facilities. Finding the best cleaning supplies and methods, as well as the most effective placement of air handlers or dust collectors, can reduce hazard points. GlutenTox and AlerTox test kits can be used to verify that equipment and surfaces meet quality control expectations and do not pose a risk to the foods being created. The final step in your quality control plan should be testing your final product. At this point, with verified clean ingredients and surfaces, you should be in the clear. Still, this validating step goes a long way towards peace of mind and will often be the most important test to document. While GlutenTox and AlerTox are designed to test finished products rapidly and on-site, it is also recommended that every facility periodically send samples to a third-party lab for independent testing. Independent labs can provide certificates of analysis that are important to keep on file as part of any quality control program. While you’re here, download Emport’s Best Practices Guides for when to test effectively and how to sample your materials.